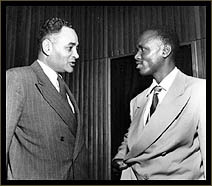 Throughout the 1940's, 50's and 60's, Ralph Bunche was widely recognized as the leading American expert on Africa and colonial affairs, and as a determined advocate of decolonization. In fact, his pioneering work at the United Nations, during its first two decades, was crucial to the self-determination struggles and political independence of close to a billion people of color throughout the world. 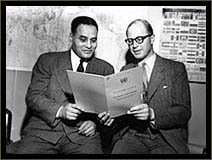 In 1946, Ralph Bunche was appointed head of the newly created Trusteeship Division of the United Nations. Bunche was an ideal choice for the post. After all, during the 1945 San Francisco Conference, he had helped to draft the sections of the UN charter that deal with trusteeship and the future of the non-self-governing areas of the world. He threw himself into his new job with characteristic fervor. Trusteeship was hotly debated, even within the United Nations itself. The Trusteeship System was designed to oversee the administration and to facilitate the transition to self-government, and even independence, of the trust territories. However, it also paved the way for other non self-governing territories to achieve independence. "[There's a] famous line of Churchill's which says, 'I did not become his Majesty's first minister to preside over the liquidation of his empire.' He was basically saying they did not intend to give these territories independence. And that was one of the compromises in the charter: the separation between the trusteeship system and the non-self-governing territories area. But Bunche was involved in both." -Interview with Donald McHenry, Former U.S. Ambassador to the United Nations. "No territory can be placed under the trusteeship system until a trusteeship agreement for that territory has been approved by the general assembly. And this will require a two thirds majority vote of that body. The charter sets forth the basic objectives of the trusteeship system and the trusteeship functions which are to be exercised by the assembly in the trusteeship council. [...] These objectives in general provide for the economic, social and political development of the peoples in trust territories to insure their rights and their freedoms and set as an ultimate goal their self government or independence." Bunche believed that self-determination of colonial peoples was critical to the maintenance of international order and world peace. He facilitated this by setting up economic and technical assistance programs for the newly independent nations and used the media to focus world attention on the issue of decolonization.